AGATE is a form of quartz having submicroscopic grains of cryptocrystalline quartz, called chalcedony, in a massive form, often filling voids as veins or geodes. Agate is often found with color bands due to impurities in the fluids from which the agate is deposited. Agate is usually translucent, sometimes transparent, and has a hardness of 7, but has no crystal structure (amorphous). There are many types of agates, some of which have become very popular with jewelers. These include: Blue lace agate, Botswana agate, Brecciated (poppy) agate, Crazy lace agate, Dendritic agate, Fairburn agate, Laguna agate, Moss agate, Onyx, and Sardonyx. Chemistry: Silica, SiO2 ♦ Variety: quartz ♦ Transparency: transparent to translucent ♦ Luster: waxy ♦ Crystal system: Amorphous ♦ Moh's hardness: 7 ♦ Color: White to grey, light blue, orange to red, black ♦ Localities: Worldwide. Our agates come mostly from Brazil, Mexico and the U.S. The color of AMAZONITE varies from green, yellow-green to blue-green, and in some gemstones demonstrates white streaks. Colorado is a well-known locality for crystals of amazonite, and it is also found in Madagascar and Brazil. Amethyst is a violet variety of QUARTZ, and has a chemical composition of SiO2. Gem quality amethyst is a relatively inexpensive gemstone often used in jewelry. Amethyst mineral specimens, geodes and large cathedrals are prized by collectors. Amethyst occurs in a wide range of purple shades from pale lilac to deep purple. When amethyst is heated, it becomes CITRINE, a yellow or orange variety of quartz. Chemistry: SiO2 ♦ Variety: Quartz ♦ transparent to translucent ♦ Luster: vitreous ♦ Crystal system: trigonal ♦ Moh's hardness: 7 ♦ Color: Various shades of purple ♦ Localities: may be found throughout the world, with notable western hemisphere occurrences in Brazil, Uruguay, Ontario, Vera Cruz, Mexico, Guerrero, Mexico, Maine, North Carolina, Pennsylvania, Colorado..
Ametrine (also known as trystine) is a variety of QUARTZ that displays both amethyst and citrine in the same mineral. Ametrine is mined mostly in Bolivia, with some being found in Brazil and India. Although ametrine occurs in nature, some ametrine products on the market have been artifically colored by the irridiation or heating of quartz. AMMONITE–AN EXTINCT SUBCLASS OF THE CEPHALOPOD CLASS OF THE PHYLUM MOLLUSCA (Mollusks). Present-day cephalopods include the octopus, squid and nautilus, which is the closest in appearance to the ammonite. Ammonites ranged in time from approximately 400 million years(Devonian) until about 65 million years. (late Cretaceous). Their chambered shells are found today, while their soft bodies, which occupied the largest and outermost chambers, are gone. The septa, plates which divide the chambers, are highly visible in cut fossilized ammonite specimens. Ammonites had a tube called a siphuncle, which carried water from outside the shell to the chambers, and was used to propel the ammonite as well as to change its depth in the water. Cephalopods, such as the ammonite, were swimming mollusks, rather than attached (pelecypods) or bottoms dwelling(gastropods) mollusks. The ammonites showed an increasingly complex pattern of sutures on their shells as time went by. Sutures are the intersections of the septa and the outer shells. Aqua Aura is created by allowing molecules of pure gold to adhere to the natural electric charge which surrounds quartz crystals. The extremely thin, transparent gold coating breaks light into its spectral colors. Aqua aura requires no special care to retain its beauty. The gold coating cannot be rubbed or scraped off. Quartz covered with 24 karat gold. The name "AQUAMARINE" is derived from Latin meaning "water of the sea." It is a blue or blue-green variety of the BERYL GROUP. Other gem quality varities of beryl are emerald and and precious beryl (bixbite, golden beryl, goshenite, heliodor and morganite). The coloring agent of aquamarine is iron. Dark blue is the most desired color for aquamarine gemstones, and clearer specimens are often heated or irradiated to attain the desired color. In the United States, aquamarines can be found at the summit of Mt. Antero in the Sawatch Range in central Colorado. In Wyoming, aquamarine has been discovered in the Big Horn Mountains, near Powder River Pass. Species: beryl ♦ Variety: aquamarine ♦ Crystal form: hexagonal ♦ Chemistry: Aluminium Beryllium Cyclosilicate ♦ Moh's Hardness: 7.5-8 ♦ Luster: vitreous, sub-vitreous, waxy, greasy ♦ Fracture: conchoidal ♦ Color: light blue to dark blue, blue-green ♦ Localities: Brazil, India, Russia, USA, Nigeria, Madagascar, Zambia, Pakistan and Mozambique. Azurite is a copper mineral which has similar origins to malachite, but is more frequently in crystalline form. However, azurite is found less commonly than malachite. Occasionally, azurite crystals are replaced by malachite, known as pseudomorphs. Azurite is characterized by its deep blue color. Fresh unweathered azurite has a vitreous luster. Mark A. Wilson (Department of Geology, The College of Wooster). Brachiopods are know as living fossils since few species are still living today. They were abundant in the Paleozoic Era now the fossils are found in Paleozoic rocks and limestone deposits throughout the world. They decreased in numbers during the Permian extinctions. Brachiopods consist of two part shells or valves that have fossilized. Fossils are found in various shapes and sizes throughout the world. Cactus Quartz, or Spirit Quartz, was first discovered in 1986 in the Magaliesberg Mountain Range near Pretoria, South Africa. It was called "Spirit Quartz" by the South African tribal medicine men who used them for healing rituals. Cactus quartz is formed by a quartz or amethyst crystal being encrusted by a second generation of smaller crystals grown on its faces. It occurs as quartz, citrine and amethyst, and comes in a wide range of colors, including purple amethyst, violet amethyst, smoky, milky clear and golden citrine. Calcite is a common rock-forming mineral. It has many industrial uses, such as cement, and is found in many colors. It occurs in many forms of crystals, and in many types of deposits, and has a strong rhombohedral cleavage. An optically clear variety is called Iceland spar, and exhibits strong double refraction, which is when a ray of light enters the mineral, it is divided into two rays that diverge. It is too soft to be used as gem material, but many beautiful crystals have been collected the world over. Chemistry: CaCO3 ♦ Group: Hexagonal Scalenohedral ♦ Color: Colorless, White, Pink, Yellow, Brown ♦ Luster: Vitreous ♦ Transparency: Transparent to translucent to opaque ♦ Moh's hardness: 3 ♦ Fracture: Conchoidal - Very brittle fracture producing small, conchoidal fragments. ♦ Localities: Found in sedimentary, igneous, and metamorphic rocks. Carnelian is a reddish variety of chalcedony. Chalcedony is a mineral mixture of quartz, moganite and another silica mineral. Agate is another form of chalcedony. The cathedrals on our Website are true wonders of nature - they come from a series of basaltic flows in the southern Brazilian state of Rio Grande do Sul. They are mined by hard rock mining methods, then cleaned cut and polished by local craftsmen. Cathedrals are large GEODES formed in large gas bubbles in basaltic lava. Cathedrals are graded for sale by exterior size and shape; crystal size, color and perfection; and overall appearance. Also, the appearance of other minerals such as calcite and quartz which form after the amethyst, may add to the value. 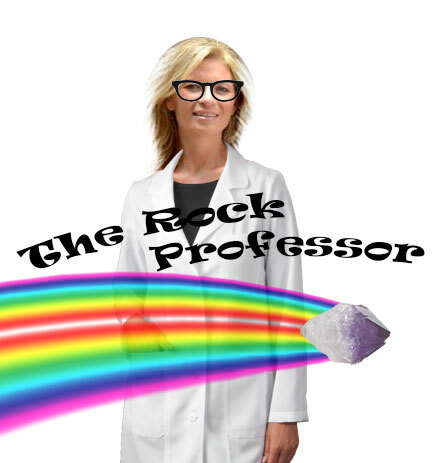 Go to these Rock Professor pages for more information on AMETHYST or CITRINE. Celestite got its name from the celestial blue color in its crystals. Celestite is distinguished by its high specific gravity (density), tabular crystals that resemble barite, relative softness and transparency to translucency. Found in sedimentary deposits, veins and cavities, it is often associated with minerals such as gypsum and dolomite. Most fine specimens today come from Madagascar. Charoite has only recently come on the market. It was discovered in Siberia, Russia in 1947, but only became known internationally in 1978. Most believe the stone was named for the nearby Chara River. Charoite has a lovely dark purple color with a swirling, fibrous appearance, and is sometimes chatoyant. The material is a silicate of potassium, calcium and sodium. Chrysocolla is a secondary mineral found in oxidized zones of copper deposits. It is abundant in the southwestern United States as well as in numerous areas worldwide. It is sometimes confused with turquoise, but it is softer. It is cryptocrystalline and is typically found in masses or fracture fillings. Citrine is a light yellow to yellowish-brown variety of QUARTZ. Natural citrine is colored by trace amounts of ferric hydroxide. Most of the citrine on the market is actually heat-treated amethyst or smoky quartz. As in other varieties of quartz, citrine has a hardness of 7, a specific gravity of 2.65, and chemically, is SiO2. It has a vitreous luster and belongs to the hexagonal crystal system. When amethyst is heated to approximately 500-600 degrees C, a yellowish-brown citrine color is produced. Not all amethyst responds in like fashion. Most of the Brazilian citrine on the market comes from the Irai region of Rio Grande do Sul. COPPER is a basic element (Cu) and is the eighth most abundant metal in the Earth's crust. It occurs as a native metal and in a some 160 compounds, some of which are azurite, malachite, chrysocolla, chalcopyrite and bornite. The alloys of copper are also important such as bronze, an alloy of tin and copper; and brass, an alloy of zinc and copper. Being malleable and ductile, copper is a good conductor of heat and electricity and has many industrial uses, among which are electric cables and wires, plumbing, heating, roofing and construction. The Egyptians are believed to be the first to create bronze, which ushered in the Bronze Age. Leading producers of copper are Chile, the U.S. and Indonesia. Three U.S. states are very rich in copper deposits: Arizona, New Mexico and Utah. Copper is mined in at least 63 countries, including Russia, Canada, Zambia, Poland, China, Uganda, Nicaragua, Australia and Mexico. Most of the native copper on our site come from the Keweenaw Peninsula, Michigan. The copper specimen pictured to the bottom left is referred to as "float copper", copper ore which was ripped loose from the earth's surface by a glacier, then traveled with the glacier to its ultimate destination and remained behind when the glacier melted. Coprolite is a variety of phosphorite (which is a variety of apatite). Coprolite deposits range in age from the Cambrian period to recent times. Coprolite's color depends on the type of soil and minerals in which it was buried. COPROLITES are the fossilized droppings of ancient creatures. The name translates as "dung stone" from the Greek words "kopros" meaning "dung" and "lithos" meanings "stone." To the eye of the observer, many of these fossils look as if they were dropped yesterday, but fortunately the original material has been replaced with minerals and there is no smell. Coprolites are trace fossils as opposed to body fossils, in that they are not part of the body of the creature that left them. Other examples of trace fossils are foot prints and burrows. Since coprolites often contain plant material or remains of other creatures, they are important to scientists as they record the diet, feeding behavior and habitat of dinosaurs and other prehistoric life. In 19th century England, coprolites were mined on an industrial scale for use as fertilizer due to their high phosphate content. Many of the coprolites on this Website come from the Eocine period (35-55 million years ago) and were dropped by turtles or sloths. These unusual single and multi-cavity geodes are Utah's version of Thunder Eggs. Within a rhyolite exterior shell, druzy and crystalline quartz-lined cavities were formed by silica-rich fluids seeping into cavities formed in the rhyolite. Some geodes have up to 5 or 6 crystal pockets, some are connected to each other, and some have small islands of banded rhyolite "floating" between the cavities. The geodes are dug from sediments formed by the ancient Lake Bonneville, and range from tiny up to about 1 foot in diameter. Eudialyte is a fairly rare mineral. It has a poor crystal habit, so when crystals are found, they are prized by collectors. However, it is very attractive when polished for use in jewelry. It has a deep red color in a matrix of black, gray and white. The Kola Peninsula, Russia, is the locality which produces much of the eudialyte seen on the market today. Eudialyte is a source of zirconium. FIRE AGATE is a gemstone variety of chalcedony (quartz family) where layers of heated iron oxides and silica line cavities in rock. Light passing through the many thin layers gives a reddish, fiery glow, from which the name fire agate is derived. The agate has a hardness of 7, and if carefully cut and polished, can make a glowing, multicolored gemstone. Chemistry: Calcium fluoride (CaF2) ♦ Class: Halides ♦ Crystal system: Isometric ♦ Moh's hardness: 4 ♦ Transparency: Transparent to translucent ♦ Luster: Vitreous ♦ Color: Purple, blue, green or yellow; also colorless, reddish orange, pink, white, brown ♦ Cleavage: Perfect in 4 directions forming octahedrons ♦ Fracture: irregular and brittle ♦ Fluorescence: Blue or more rarely green, white, red or violet and may be thermoluminescent, phosphorescent and triboluminescent ♦ Localities: China, Germany, Austria, Switzerland, England, Norway, Mexico, and both Ontario and Newfoundland in Canada. It is found in many states in the US, notably Illinois. FLUORITE is not only a much-used industrial mineral, but is also highly sought after by collectors for its many colors, translucency, association with many other minerals, and cubic crystals. Chemically, fluorite is calcium fluorite, and is often found in hydrothermal vein deposits along with other minerals such as calcite, sphalerite, barite, galena and quartz. Large deposits of fluorite were mined in the Cave-in-Rock District of Illinois until the 1990's, and lesser amounts have been mined in many areas of the U.S., where it is often used as a flux in steel production. Other large deposits have been mined in Canada, England, China, and many other areas. Fluorite is often found that fluoresces under untraviolet light, most commonly blue, and the name "fluoresce" stems from the mineral name. Physically, fluorite is a soft mineral (H=4), and is easily identified by its colors, hardness, strong cubic cleavage and cubic crystals. Fluorite is found in many colors, including purple, blue, green, yellow, pink, red, white, brown, and black. It is sometimes zoned, where outer layers have different colors and/or shades of colors. In the southern Illinois deposits, small chalcopyrite crystals were found within the fluorite crystals. Some of the massive Chinese deposits exhibit beautiful multicolored banding, and many carvings and beads have been made from this material. Grossularite is a calcium aluminum silicate. It can be colorless, gray, many shades of yellow and green, also pink, red, brown and black. Pyrope is a magnesium aluminum silicate. Colors are blood-red, dark red, purplish-red, orangish-red and pinkish -red. Spessartite is a manganese aluminum silicate, and can be orange, reddish-orange, red, reddish-brown, yellowish-brown and brown. Almandite is an iron aluminum silicate, Almandine is typically a deep red-violet, also can be red, brownish-red and brownish-black. Andradite is a calcium iron silicate. It occurs in yellowish-green, green, greenish-brown, gray and black. Uvarovite is a calcium chromium silicate; the color is dark green. The uses of garnet are as gemtones and abrasives. Because they are hard, lack cleaveage and fracture into sharp, irregular pieces, garnets are an excellent abrasive. As a gemstone, they highly refractive, hard, have beautiful colors, and are transparent. However, possibly due to their abundance and widespread use, they do not fetch a high price as a gemstone. GEODES are spheroidal to eccentric-shaped rocks formed when minerals either enter or are trapped in openings or voids inside preexisting rock material. In volcanic rocks, fluids and gases often remain inside air pockets in the lava. During and after cooling, these fluids, from the outside in, fill the cavity with various successions of agate and quartz layers, often ending in open cavities with inward-facing quartz crystals. Other geodes may be formed by cavities formed by dissolved organic material, fractures in the rock, or by pockets caused by dissoved mineral material. These geodes will often have tapered layers that lead to in "inlet", where the filling solutions entered the cavity. Rarely, a geode will be partially filled in the center by a horizontal sequence of layers inside the concentric bands, ending in a flat surface. This is a gravity filling of the cavity with materials probably under less pressure, ending when there are no more fluids. You can tell which way was "up" when the geode formed. Colors within the geodes are caused from elements, such as iron, that are carried in the solutions. Most geodes are composed of agates, a member of the quartz family, although some geodes are formed of calcite, usually in limestone pockets. Halite is the mineral form of sodium chloride, NaCl, commonly known as rock salt. It is easily distinguished by its taste. Halite is found in many current evaporative deposits such as near Salt Lake City, Utah and Searles Lake California in the U.S., where it crystallizes out of evaporating brine lakes. The mineral is typically colorless to yellow, but may also be light blue, dark blue, and pink depending on the amount and type of impurities.The color in pink halite is due to the organism Halo bacterium that lives in the concentrated brine. Chemistry: NaCl, sodium chloride ♦ Class: Halides ♦ Color: colorless, white, blue, gray, yellow, red ♦ Luster: vitreous ♦ Cleavage: perfect in three directions forming cubes ♦ Fracture: conchoidal ♦ Crystal System: isometric ♦ Transparency: transparent to translucent ♦ Moh's hardness: 2.5 ♦ Other Characteristics: Salty taste ♦ Localities: Searles Lake, California and Utah in the U.S., Germany, and Mulhouse, France, worldwide in sedimentary basins. The name hematite is derived from the Greek word for blood (haima) because hematite can be red. Hematite is mined as the main ore for iron. Some uses of the mineral are as a polishing compound (rouge), coloring pigment for bricks and tile, and in jewelry. Kunzite is a lilac colored gem variety of the mineral Spodumene, which is a lithium aluminum silicate. Kunzite is found with Morganite and in lithium rich pegmatites, often as very large crystals. It is deeply striated vertically. Another variety of spodumene is the pale green hiddenite, found notably in North Carolina. Chemistry: aluminum silicate, Al2SiO5 ♦ Crystal system: Triclinic ♦ Habit: columnar, forms columns ♦ Habit: Fibrous crystals ♦ Moh's hardness: 4 to 5 in one direction 6 to 7 in another direction ♦ Transparency: Transparent to translucent ♦ Luster: Vitreous to pearly ♦ Color: Blue principally, but also white, gray or green. Color is often not consistent throughout the crystal ♦ Cleavage: Good in one direction parallel to the flat blade face ♦ Fracture: Brittle ♦ Localities: Brazil, Virginia, North Carolina, Georgia, Switzerland, Russia, Serbia, India and Kenya. The name, KYANITE, is from the Greek "kyanos" meaning blue. It is an aluminum silicate and is a metamorphic mineral. Kyanite is a polymorph with two other minerals: andalusite and sillimanite. (A polymorph is a mineral that shares the same chemistry with another mineral, but that has a different crystal structure). The mineral forms blue fibrous blade-like crystals, often with a darker blue color near the center and a lighter color towards the outer edges of the blades. Kyanite is a beautiful gemstone when faceted, but it is difficult to process as it has two different hardnesses depending upon direction. Parallel to the length of the crystal, kyanite has a hardness of 5. At right angles to this direction it is 7. Labradorite is a semi-translucent, gray gemstone with a beautiful play of colors called labradorescence. As one turns the stone one can see flashes of blue, violet and green and sometimes orange and yellow. Labradorite is named from the locality where it was first found: Labrador, Newfoundland. Another variety, spectrolite, is found in Finland. Chemistry: Sodium calcium aluminum silicate sulfur sulfate ♦ Class: Silicates ♦ Subclass: Tectosilicates ♦ Group: Both the Sodalite and feldspathoid groups ♦ Associated Minerals: Calcite, pyroxenes and pyrite ♦ Crystal system: Isometric ♦ Moh's hardness: 5-5.5 ♦ Transparency: translucent to opaque ♦ Luster: dull to greasy ♦ Color: brilliant blue with violet or greenish tints ♦ Cleavage: Poor ♦ Fracture: Uneven ♦ Localities: Afghanistan; Chile; Russia; Italy; USA - California (San Bernardino Mountains and Ontario Peak) and Colorado (Sawatch Mountains). LAPIS or LAZURITE is a rare and prized mineral; used in both jewelry and carvings. It was first mined thousands of years ago in northeastern Afganistan, where the richest lapis still is found today. Lapis occurs mostly as lapis lazuli, a mixture of lazurite and lesser amounts of pyrite and white calcite. The color of the highest quality material is a rich, deep blue, with no calcite visible. Lower grades (today often called "denim lapis"), have more of a spotty look, with patches of lazurite in a matrix of calcite. The stone has a medium hardness, and prices vary in today's market from $20/lb. for low-grade rough material up to several hundred dollars per pound for the very highest quality. Lapis is also mined in Chile, Siberia, and is found in minor amounts in many countries, including the U.S.
LAZULITE is a different mineral, chemically as well as in its occurence, but also is bluish in color. It is distinguished from lapis by the absence of pyrite as well as calcite. LARIMAR is a rare blue variety of pectolite (calcium-sodium silicate) found only in the Dominican Republic, in the Caribbean. Since being officially discovered in 1974 by Miguel Méndez and Peace Corps volunteer Norman Rilling, the beautiful stone has been extracted from volcanic tubes or chimneys where it was formed. Pectolite is found in a variety of locations, however none have the volcanic blue coloration of LARIMAR which owes its beautiful color to copper. Malachite is composed of 66% copper and can be used as an ore of copper. It usually forms in layered masses of radiating fibers, forming stalactitic formations which are often polished to beautiful bullseyes or bands. In Russia, it was a favorite stone of the Tsars and was made into columns, surfaces, and vases. Chemistry: copper carbonate ♦ Opaque ♦ Luster: from silky to dull ♦ Crystal system: monoclinic prismatic ♦ Moh's hardness: 3.5-4 ♦ Color: bright green ♦ Localities: Ural mountains of Russia, DR Congo, and southwestern U.S. copper districts. The Willamette Meteorite, discovered in the Willamette Valley, Oregon, is now on display at the American Museum of Natural History in New York City. That bright streak of light, or shooting star, that we see in the night sky is produced by the entry of a small meteoroid into the Earth's atmosphere. A meteoroid is any object in space that is too small to be called an asteroid or a comet. A METEORITE is a meteoroid which survives its fall to Earth without being vaporized. Meteorites are intriguing to scientists as a rare source of material evidence of the universe beyond the Earth. There are three main types of meteorites. The most abundant are stone meteorites which are primarily made up of silicate minerals such as olivine, pyroxene and feldspar. As their name implies, iron meteorites are mainly composed of iron but also contain a significant amount of nickel. The rarest of the three are the stony-iron meteorites. They are a mixture of stony and metallic materials. MEXICAN ONYX is a name given to a fine-grained variety of calcite formed in caves and waterfalls, and is known as travertine. The material forms in a number of different colors, and is sometimes dyed, and is carved into animals, geometric shapes and other ornamental items. Since calcite is dissolved with hydrochloric(muriatic) acid, pieces are often given their final polish by immersing them in acid. Travertine is found in many parts of the world including the US. Massive deposits in Pakistan are also being used for cutting and carving into many beautiful objects. Click her for more information on PAKISTANI ONYX. Chemistry: variety of calcite ♦ Luster: vitreous to dull ♦ Color: banded with multiple orange, yellow, red, tan, brown and white colors ♦ Fracture: subconchoidal ♦ Crystal system: orthorhombic ♦ Moh's hardness: 3.5-4 ♦ Localities: Baja California, Mexico. Moldavite is a type of TEKTITE, a natural glass rock with rounded or irregular shapes and pitted or wrinkled surfaces. The Impact Theory states that TEKTITES may be fused glass that formed during an impact of a meteor with layers of rock on the Earth's surface. The TEKTITE contains properties from both the meteor and the Earth crust at the impact site. MOLDAVITE is a jewelry-quality Tektite, stemming from a meteorite that collided with earth approximately 14.7 million years ago and created the Ries crater in Germany. Moldavites are found in a "strewnfield" centered around Moldavia in former Czechoslovakia. MOONSTONE, or adularia, is a potassium feldspar of the orthoclase species. It is composed of two feldspar minerals, orthoclase and albite. Moonstone is prized as a gemstone because of its silvery or blue shimmer called adularescence, which is due to diffraction of light as it hits thin, alternating layers of orthoclase and albite within the gem. Chemistry: Potassium aluminum silicate hydroxide fluoride ♦ Class: Silicates ♦ Group: micas ♦ Crystal system: monoclinic ♦Luster: vitreous to pearly ♦ Color: white, silver, yellow, green and brown ♦ Transparency: transparent to translucent ♦ Fracture: uneven ♦ Cleavage: perfect in one direction producing thin sheets or flakes ♦ Moh's hardness: 2 - 2.5 ♦ Localities: India, Pakistan, Brazil and many USA localities. MUSCOVITE was once commonly used for windows. The Russian mica mines that produced it gave muscovite its name (it was once widely known as "Muscovy glass"). Muscovite is is a high-aluminum member of the mica family of minerals, all known for the property of perfect basal cleavage; cleavage layers can be easily peeled off into very thin sheets which are quite durable and are not easily destroyed by erosion. Muscovite sheets have high heat and electrical insulating properties and are used to make electrical components. Orthoceras fossile are found in the Saharan desert (Northern Africa). The name "orthoceras" means "straight horn" and refers to the creature's long, conical shell. In these shells lived Orthoceras, an ancient mollusk whose fossil shells are found and polished in the Sahara Desert of Morocco. Like the Nautilus shown above, Orthoceras used its siphuncle to control bouyancy as well. By controling the ratio of air to water in the siphuncle, Orthoceras could move up and down in the water. Orthoceras's soft body lived in the open segment at the end of it's shell. As its body grew, and that part of the shell became too small, a dividing partition called the septa grew to separate the old "home chamer" from the new one. Orthoceras grew as large as 14 feet! In the Devonian geologic period, some 350 million years ago, these ocean dwellers, reaching a length of over 6 feet, swam in an Ocean which covered the area. After death, their shells were preserved in the black marble where they are found today. Orthoceras fossils have an iridescent gemlike quality when polished and because of their incredible age and beauty make for unique display pieces and jewelry. True onyx is a fine-grained siliceous gemstone, but the term has been used for calcareous marble-like layered sediments, technically termed travertine. This onyx is typically deposited from solutions in ground and surface waters, often in caves. The often colorful and banded surfaces, when polished, are sought after for their beauty. Travertine is found in many parts of the world including the US. Deposits of travertine in Mexico are also being used for cutting and carving into many beautiful objects. Click her for more information on MEXICAN ONYX. PERIDOT, the gem variety of OLIVINE, is the official August birthstone. Although it occurs in several locations worldwide, it is most famously found on the San Carlos Indian Reservation in southern Arizona, where 80-95% of the world supply of peridot is produced. Olivine is composed of two minerals, and ranges from magnesium-rich (fayalite) to iron-rich (forsterite). It has strong birefringence, which means when you look into the gem you will often see a doubling of the facet edges and you can see a doubling of the inclusions as well. Variety of: olivine ♦ Chemistry: iron magnesium silicate ♦ Color: yellow, olive green, brownish, lime green, emerald green ♦ Crystal system: orthorhombic ♦ Cleavage: poor ♦ Fracture: concoidal ♦ Moh's hardness: 6.5-7 ♦ Luster: vitreous ♦ Transparency: transparent to translucent ♦ Localities: Arizona, California, New Mexico, Myanmar (Burma), islands of the Red Sea, Kohistan, Pakistan, Germany, Mexico, Norway, Hawaii. Petrified wood: The name comes from the Greek "petro" or "rock", and refers to wood that has been turned to stone. The process of petrification preserves parts of ancient trees in fossil form. When the wood becomes buried under sediment, mineral-rich water flows through the sediment and replaces the cells' structure with minerals, producing a very good stone copy of the original piece of wood. The predominant minerals in petrified wood are silicates, such as quartz. It's quite wondrous to examine a piece of petrified wood, knowing that it represents part of a hugh forest existing millions of year ago. Minerals : Quartz, manganese, iron, copper, carbon, cobalt, chromium, iron oxides. ♦ Classification: Fossil ♦ Moh's hardness: 7 ♦ Color: Brown, red, yellow, orange, black green/blue ♦ Localities : Argentina, Belgium, Canada, Czech Republic, Germany, Egypt, Greece, Libya, United States, Australia, India, New Zealand. Picasso marble is named after a geometric grid of black and tan lines that criss-cross the matrix of the stone, resembling an abstract painting. Marble is a metamorphic equivalent of limestone, and this material appears to have been altered to marble by its contact with igneous material, which “cooked” the limestone and flooded the stone with solutions that traveled through a network of fractures, coloring the stone. The marble is fine-grained, takes a satin-finish polished, and is found in southwestern Utah. Because of the metallic luster and golden color, pyrite has sometimes been mistaken for gold, leading to its nickname as "fool's gold." The mineral's isometric crystals appear as cubes or pyritohedrons (12 irregular, pentagonal or five-sided faces). Pyrite has the same chemistry as marcasite, but a different structure. It is a very common mineral, found in many parts of the world. The specimens on this site are from Peru. Chemistry: Iron Disulfide ♦ Group: Sulfides ♦ Color: pale brass yellow, dull gold ♦ Luster: metallic ♦ Transparency: opaque ♦ Crystal system: isometric ♦ Moh's hardness: 6 - 6.8 ♦ Localities: include USA, Peru, Germany, Russia, Spain and South Africa. Formed in the seams between black shale and coal 300,000,000 years ago, these pyrite dollars do not appear to be fossils, but an aggregate of tiny pyrite crystals. Today, they are collected by coal miners in Randolph County, Illinois. As the Illinois coal mines are shut down one by one, these specimens will become more and more rare. Of all the minerals, quartz is closest to a pure chemical compound and has constant physical properties. Crystals are often terminated by a hexagonal pyramid. Quartz is the most common rock-forming mineral on the planet. It is extremely resistant to weathering. It breaks down into sand grains which often form sedimentary rocks. Chemistry: Silicon Dioxide ♦ Family: quartz ♦ Transparency: transparent to translucent ♦ Luster: vitreous ♦ Crystal system: hexagonal ♦ Moh's hardness: 7 ♦ Color: colorless or white ♦ Localities: Found in abundance worldwide, notably Arkansas and Brazil. Chemistry: Manganese Carbonate (MnCO3) ♦ Class: Carbonates ♦ Group: Calcite Group ♦ Crystal system: Trigonal ♦ Moh's hardness: 3.5 - 4 ♦ Transparency: Transparent to translucent ♦ Luster: Vitreous to resinous ♦ Color: Red to pink, sometimes almost white, yellow and brown ♦ Cleavage: Perfect in three directions forming rhombohedrons ♦ Fracture: Uneven ♦ Other characteristics: Pink and white banding in massive forms ♦ Localities: Sweet Home Mine American Tunnel mines, Colorado; Montana; New Jersey; Arizona and California, USA. Also found in Argentina, Peru, Kazakhatan; Romania; England; Germany; Namibia; Mexico; South Africa; Canada and many other localities from around the world. RHODOCHROSITE is a sought-after, colorful mineral. Earlier considered as gangue or waste rock to be removed to get at the valuable ore, rhodochrosite was thrown aside and buried in districts such as Leadville, Colorado. Its lower quality ore is sometimes processed for its manganese content in places such as Argentina. Most noticeable features are its rose-watermelon color in its purest form, its relatively soft(H=3) hardness, and its solubility in dilute acids. In many areas including Colorado and Peru, rhodochrosite is found as rhombohedrons in crystalline form, associated with numerous other minerals, such as pyrite, quartz, tetrahedrite and fluorite. Argentinian rhodochrosite is better know for its banding, stalactitic forms, and its great beauty when cut, carved and polished. Lesser quality material can be paler red or even reddish tan in color. RHODONITE is named after the Greek word for rose, rhodon.Chemically, it is manganese silicate. Its color is usually pink but it can range to dark pink and even to brown. Rhodonite is distinguished from another pink manganese mineral, rhodochrosite, by its greater hardness (5.5 to 6) and by the presence of black streaks of manganese oxide. Rhodonite typically comes in massive, coarse and fine granular aggregates. Because of its attractive color and black streaks of manganese oxide, rhodonite is often carved into cabochons, beads and carvings. Chemistry: MnSiO3 ♦ Chemical group: silicate ♦ Crystal system: triclinic ♦ Transparency: transparent to translucent ♦ Luster: vitreous ♦ Moh's hardness: 5.5-6.5 ♦ Fracture conchoidal to uneven ♦ Color: light brownish red, flesh red, rose pink ♦ Cleavage: 2 directions are perfect, one direction imperfect ♦ Localities: Worldwide, with notable occurrences in Brazil, Uruguay, Ontario, Mexico, Maine, North Carolina, Pennsylvania, Colorado. Rose quartz - a variety of QUARTZ - ranges from pale pink to deep rose, and sometimes even to an amethystine hue. Generally, rose quartz is massive in form, and is rarely found as crystals. It is sometimes used as a semiprecious stone, and takes an impressive polish. Rose quartz is usually found within pegmatites, often occurring with micas and tourmaline. Chemistry: SiO2 ♦ Variety: Quartz ♦ Transparency: transparent to translucent ♦ Luster: vitreous ♦ Crystal system: trigonal ♦ Moh's hardness: 7 ♦ Color: Various shades of purple ♦ Localities: Worldwide, with notable western hemisphere occurrences in Brazil, Uruguay, Ontario, Vera Cruz, Mexico, Guerrero, Mexico, Maine, North Carolina, Pennsylvania, Colorado. RUBY is the red variety of corundum, the second hardest natural mineral (9.0 on the Mohs scale of mineral hardness). Sapphire is the non-red variety of corundum and is generally thought to be blue, although it exists in nearly any other color. A very small amount of chromium gives corundum a pink color. Larger amounts produce stones that are a deep traffic light red, and are known as rubies. Chemistry: aluminum oxide ♦ Color: pink to deep red ♦ Luster: adamantine to vitreous ♦ Transparency: transparent to translucent. ♦ Crystal Form: hexagonal ♦ Cleavage: none ♦ Moh's hardness: 9 ♦ Localities: Burma, Cambodia, Sri Lanka, India, Afghanistan, Montana, other areas. Rutile is one of the five forms of titanium dioxide (TiO2) found in nature. Titanium is a metal used for high tech alloys because of its light weight, high strength and resistance to corrosion.It derives its name from the Latin rutilus, red, in reference to the deep red color of some specimens when viewed by transmitted light..
Rutile has among the highest refractive indices of any known mineral and also exhibits high dispersion. Small rutile needles present in gems are responsible for an optical phenomenon known as asterism. Asterated gems are known as "star" gems. One of the crystal forms that it takes is that of slender needles (acicular) embedded in large quartz crystals A beautiful stone produced by large inclusions of golden rutile needles in clear quartz is called rutilated quartz. Rutile can also form its own interesting and beautiful mineral specimens. SANDSTONE is a sedimentary rock composed of sand-sized grains of quartz and feldspar.The spaces between grains may be empty or filled with either a chemical cement of silica or calcium carbonate or a fine-grained matrix of silt and clay particles. Sandstones often form in layers in environments where large amounts of sands can accumlate such as beaches, deserts, flood plains, and deltas. Sandstones are often used as building stones, and have importance to geologists as indicators of erosional and depositional processes. Selenite is a transparent and colorless variety of the mineral gypsum. It is known for being so soft that it can be scratched with a fingernail. It has three unequal cleavages and is typically formed by evaporation of salt waters. It has been found in crystals over 40 feet long in localities in Mexico. Selenite is found in areas of Mexico and the U.S. in clusters of crystals resembling rosettes, popularly known as desert roses. Chemistry: hydrous calcium sulfate ♦ Variety of: gypsum ♦ transparent ♦ Luster: vitreous to pearly ♦ Crystal system: monoclinic prismatic ♦ Moh's hardness: 2 ♦ Color: Colorless ♦ Localities: Extensive deposits worldwide. Composition: Calcite (the yellow centers), Aragonite (the brown lines) and the bentonite clay (outer grey rock). Occasionally the fossil or some of the fossils which started the formation of the rock is noticeable in the rock ♦ Localities: Utah, New Zealand, worldwide. Utah Septarians are found near Zion National Park in Southern Utah. They are a beautiful rock that started their formation approximately 150 million years ago when the gulf of Mexico reached what is now southern Utah. Volcanic eruptions killed the sea life and they became trapped in the sediment and formed mud balls. The ocean returned depositing more shell life above them. As this decomposed, calcite from the shells was carried down into the cracks of the mud balls, and calcite crystals formed. A thin wall of calcite was transformed into aragonite dividing the bentonite clay (shale) exteriors from the calcite centers. Because of this dividing wall (septum in Latin) the geodes are called Septarians. Seraphinite is also known as clinochlore of the Chlorite Group. The lovely dark green color is enhanced by a silvery and feathery shimmer caused by mica inclusions. Seraphinite was named for seraphim, the highest order of angels, because of the feather-like appearance of the chatoyant fibers in the stone. This amazing fossilized shark tooth is the petrified remains of a species known as CHARCHAROCLES MEGALODON and was once believed to have been related to the great white shark. ThiS distant cousin of the mako shark is thought to have been the size of a railroad box car (approzimately 50 feet), to have weighed eight times more than a great white, and to have hunted whales when it cruised the oceans 15 million years ago. Smoky quartz is a variety of QUARTZ. The brown, black or smoky gray color is due to exposure to radiation - either natural or artificial. Smoky quartz is used as an inexpensive gemstone, and is a popular material for carved objects such as spheres, figurines, pyramids, etc. Sodalite is named for its sodium content. It is a dark blue semiprecious mineral of the feldspathoid group. It has a hardness of 5.5-6 and a specific gravity of about 2.3, making it lighter than quartz. Brazilian sodalite commonly occurs with veinlets of calcite. Fairly rare, sodalite is also found in Canada and Russia. Sodalite is one of the common constituents of lapis lazuli. Tiger eye has been a popular stone for thousands of years. The stone exhibits a silky luster as light is reflected within its thin parallel fibrous bands. This effect is called CHATOYANCY (from the French: CHAT meaning cat and OEIL meaning eye: CAT'S EYE.). A member of the quartz species, tiger eye is a mixture of chalcedony and the fibrous silicate mineral riebeckite. Species: quartz - variety of chalcedony ♦ Chemistry: silicon dioxide ♦ Color: brown, yellow-brown ♦ Cleavage: none ♦ Fracture: fibrous ♦ Transparency: opaque ♦ Luster: vitreous ♦ Crystal System: trigonal ♦ Moh's Hardness: 6.5-7 ♦ Localities: South Africa, Australia, Burma, India, Namibia, USA. TOPAZ is a common gemstone that has been prized for centuries for its hardness, clarity, and beauty. Mineral collectors are attracted to its well-formed crystals. Topaz is a silicate mineral of aluminum and fluorine, and is one of the hardest minerals in nature. Crystals have been found in sizes reaching several hundred pounds. Pure topaz is colorless and transparent; typical topaz is white, yellow, pale gray or reddish-orange, blue brown. Orange topaz, also known as precious topaz, is the traditional November birthstone. Imperial topaz is yellow, pink or pink-orange. Many brown or pale topazes are treated to make them bright yellow, gold, pink or violet colored. Blue topaz rarely occurs naturally, and colorless, gray or pale yellow and blue material is often heat treated and irradiated to produce a darker blue. Chemistry: fluorine aluminium silicate ♦ Crystal Form: Orthorhombic system ♦ Moh's Hardness: 8 ♦ Cleavage is perfect in one direction, basal ♦ Fracture is conchoidal ♦ Color: Earth Color, yellow, yellow-brown, honey-yellow, flax, brown, green, blue, light blue, red and pink ♦ Localities: Minas Gerias, Brazil; Pakistan; San Diego County, CA; Ural Mountains, Russia; Mexico and the Thomas Range, Utah. Chemical Group: Silicate ♦ Group: Tourmaline ♦ Crystal forms: Trigonal system ♦ Color: black, brown, dark blue, colorless, pink, red, green, blue and even multicolored. Crystals frequently contain two or more colors ♦ Luster: Vitreous ♦ Transparency: Transparent to opaque ♦ Fracture: Conchoidal ♦ Cleavage: Poor ♦ Moh's hardness: 7.5 ♦ Localities: Brazil; The USA from Maine, New Hampshire, South Dakota, California. The tourmaline group refers to a number of related species and varieties of minerals. Tourmaline is a complex crystalline silicate containing aluminum, boron, and other elements, and is used in electronic instrumentation and, especially as a gemstone in its green, clear, and blue varieties. Although tourmaline has been known since ancient times, it was only imported by the Dutch from Sri Lanka in 1703. The name "tourmaline" is derived from a Sinhalese name, "turamali," meaning "stone with mixed colors." Follow the links below to read about some of the varities of TOURMALINE. Similar to the horseshoe crab, Trilobites - meaning 3 lobes-lived from 550 to 200 million years ago in Cambrian, Paleozoic, and Devonian seas. Trilobites are most closely related to the chelicerates, which include the horseshoe crabs and spiders. They are now all extinct, but their fossil remains are found in many places in the U.S. and worldwide. Some, in the Canadian Rockies, have been found as large as 2½ feet in length. Turquoise is a stone used in ancient jewelry and artifacts, having been mined since at least 6000 BC by early Egyptians, and has been in fashion ever since. The name comes from a French word, "turquoise" which means Turkish, from which country Persian material passed on its way to Europe. Turquoise is a secondary mineral found often in the weathered zone of a copper deposit. The finest turquoise comes from Iran, but beautiful specimens are also found in the southwestern US. Class: Phospates ♦ Chemistry: CuAl6(PO4)4(OH)8•4(H2O) ♦ Crystal system: Triclinic Pinacoidal ♦ Moh's hardness: 5-6 ♦ Transparent to translucent ♦ Luster: Waxy ♦ Color: Blue, blue green, green, green gray, light blue ♦ Cleavage: Good, distinct, shiny cleavage surface ♦ Fracture: Conchoidal ♦ Localities: Nishapur Deposit, Iran; Arizona and New Mexico, USA; Australia; Afghanistan and other localities in the Middle East.